Samsung unveiled the Galaxy A30 and A50 smartphones at the Mobile World Congress last week. 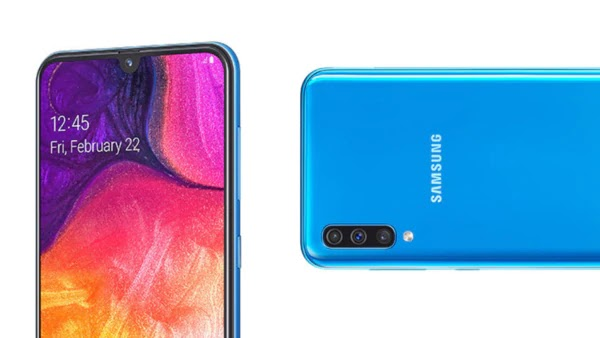 These phones are an attempt from Samsung to capture the mid-range market, the Galaxy A30 and A50 are aimed at bringing flagship features to lower prices. However, some reports suggest that there would be another smartphone joining the line-up, namely the Galaxy A60. In a report, GSMArena stated that the Galaxy A60 would look similar to the Galaxy A50, but might have beefier specifications underneath, with Qualcomm's Snapdragon 6150 chipset powering it. This is paired with up to 8GB of RAM and 128GB of internal storage. GSMArena also added the smartphone will have a USB Type-C port at the bottom along with a 3.5mm headphone jack and a triple camera setup at the back comprising a 35MP+5MP+8MP configuration. The 5MP camera at the back is a depth sensor with the 8 MP camera coming with an ultra-wide angle lens. The renders don't how the presence of a physical fingerprint sensor. This hints at the presence of an in-display fingerprint scanner, much like the Galaxy A50. 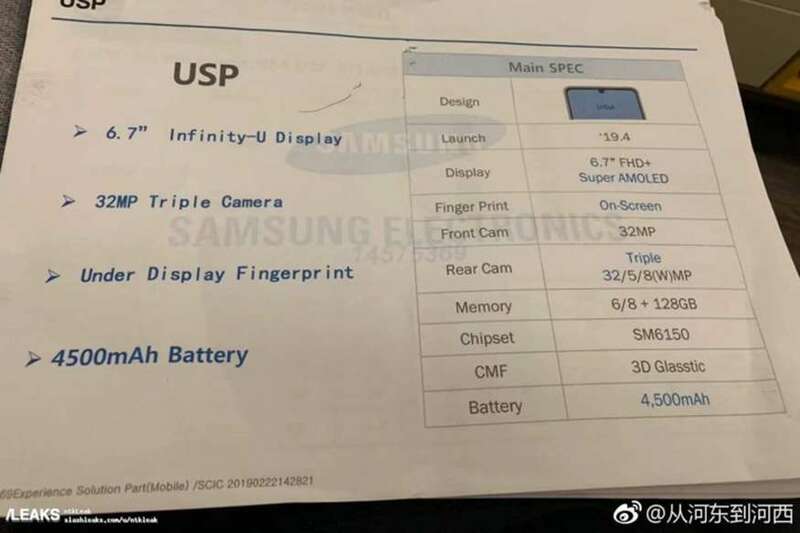 The Galaxy A60 is allegedly going to feature a large 6.7-inch Super AMOLED display with an FHD+ resolution (2340 x 1080 pixels) considering the A50 had a similar resolution. There is a tiny water drop notch on top which Samsung likes to call Infinity-U. Coming back to the Galaxy A30 and A50, the smartphones offer 6.4-inch Super AMOLED Infinity U-display with a resolution of 2340x1080. The Galaxy A30 is powered by the same Exynos 7904 found inside the Galaxy M20. It is paired with to 4GB of RAM and 64GB of internal storage. In terms of optics, it has a 16MP+5MP rear camera configuration while at the front it has a 16MP selfie clicker. The Galaxy A50 runs the Exynos 9610 processor paired with up to 6GB RAM and 128GB internal storage. It has 25MP+8MP+5MP triple rear cameras and a 25MP front-facing camera. It has an in-display fingerprint scanner.